So please bear with me on this post as it does revolve around food, but maybe isn’t exactly what you were expecting. Please do go and visit my Instagram page for lots of yummy food pics to make up for it. So on Sunday, for Father’s Day, the kids and I headed out to celebrate with Ed, who not only is a brilliant step daddy to my two children but he’s also about to become a daddy for the first time to the big ol’ baby in my belly. 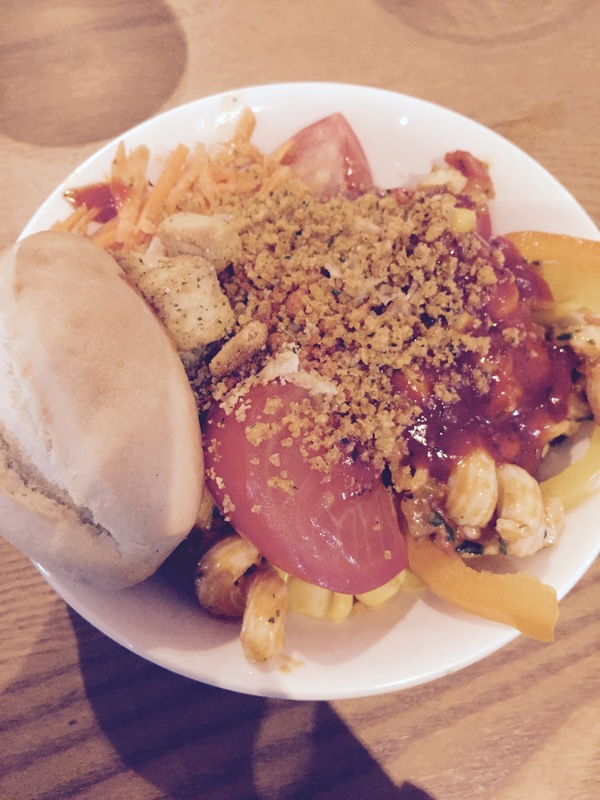 I had already picked Harvester as a fairly budget friendly option, as it was also Ed’s birthday on Tuesday which we would be going out for another meal for and I didn’t have the pennies for anything too pricey. Now last time I went to harvester (not too long ago, just before I found out I was pregnant, so maybe 4 months) there was no way of booking a table at the chain. For this reason we deliberately went out of peak times and arrived around 4.15pm at the closest branch to us – Alder Hills in Poole. The car park wasn’t too full, result I thought and we all trundled in, to be met with stony faces from the staff on the door who asked us if we had a booking, scoffed when I explained I didn’t realise you could book a table, and then proceeded to say ‘you can only do it online’. We were made to stand there waiting for a few minutes whilst three members of staff looked at a screen and eventually, after much muttering about other diners who had booked being due to come in, the fact that we would take ages to eat because of the kids and the fact that we had come in during ‘peak time’ without a booking, we were eventually turned away without any suggestion of where we should go or proper apology. Luckily I had the sense to google the next closest branch (Durley Chine in Bournemouth) and rang to ask if they had any space. They assured me they did and we arrived soon after to a much more cheerful reception from the door staff, a table overlooking the sea (although the weather meant we saw more grey, washed out sky than sunny seaside, but that wasn’t there fault). We filled up on salad and had an enjoyable meal with fairly good service and nice food. The kids were happy and I was appeased after my initial annoyance. Fast forward to Wednesday evening when I had a long planned girls night with my ‘mum’ friends (the friends I met during my pregnancy with Carly). We tend to alternate our catch ups between a local branch of Harvester, Sprinkles, a local dessert bar, and occasionally mix it up with a curry. 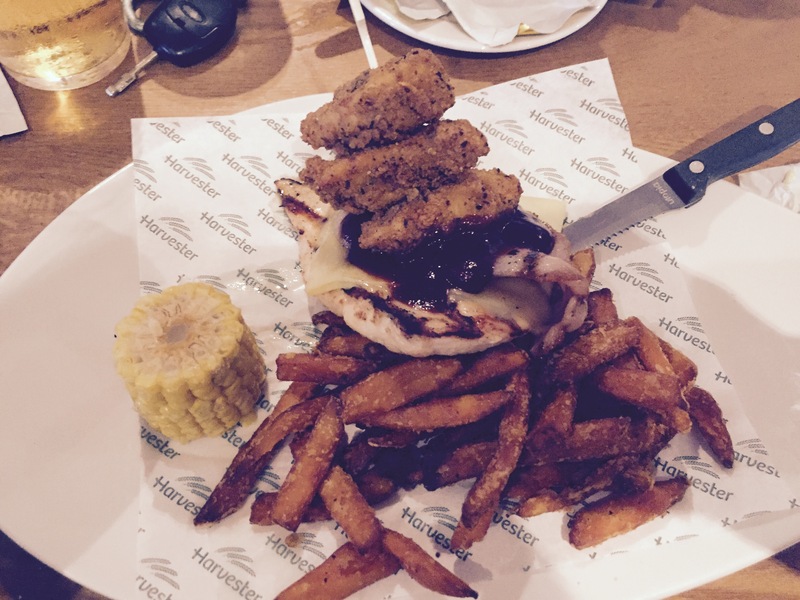 It was Harvester’s turn and I wasn’t expecting huge things after my disappointing weekend experience. We went to the Cooper Dean branch in Bournemouth. Three of my friends arrived first and apparently were told there was a 45 minute wait, before being told they would move some tables around to seat us (apparently this was said as if they were doing a huge favour and the man huffed about it). Service was incredibly slow. To start with there were lots of other diners, but they quickly dispersed and we were one of the only tables left before long. This did nothing to improve the service, however, and we were sat waiting for ages for anyone to take our dessert order. Alongside this, we had the very moody man who had seated us, who glared at me when I took a photo of my salad bowl (for the blog), messed up our drinks order, gave two of us the wrong meal (we didn’t dare correct him as he looked like he might break down if we did, so we waited until he had gone to swap them over). At the end of the meal, we waited over half an hour for anyone to bring over a bill and when we eventually chased somebody up they came over, dropped the bill on the table and said we would have to go to the bar to pay for ourselves. I’ve never had an experience like it before. We all traipsed up to the bar where the poor barman (I believe he was fairly new) had clearly not been trained to settle table tabs before and had to get the same man who had given us the bill to help him. We each paid our separate bill and when it came to me I also asked for an email address to complain to. The man from earlier came bustling over asking what was wrong and why I was complaining. I explained I had never experienced such bad service and he made excuses and seemed reluctant to hand over any information. I felt fairly intimidated, especially as I’m currently five months pregnant and he was stood quite close and demanding to know why I was going to complain. It was not a good end to the night and I will definitely not be suggesting we return to Harvester again, for this or for any other occasion. Once bitten, twice shy and all that jazz. Since the menu update, the prices aren’t even that reasonable there and food is always a little hit and miss (although I admit I will miss that damn salad bar).